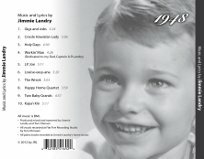 All piano tracks recorded at Jimmie’s home studio. Vocals recorded at Tom Ohmsen’s Flat Five studio. Mixed and mastered by Tom and Jimmie.